Research into the rehabilitation of individuals following Traumatic Brain Injury (TBI) in the past 15 years has resulted in greater understanding of the condition. The second edition of this book provides an updated guide for health professionals working with individuals recovering from TBI. Its uniquely clinical focus provides both comprehensive background information, and practical strategies for dealing with common problems with thinking, memory, communication, behaviour and emotional adjustment in both adults and children. The book addresses a wide range of challenges, from those which begin with impairment of consciousness, to those occurring for many years after injury, and presents strategies for maximising participation in all aspects of community life. 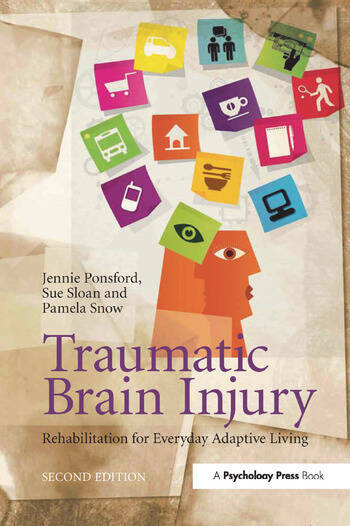 The book will be of use to practising clinicians, students in health disciplines relevant to neurorehabilitation, and also to the families of individuals with traumatic brain injury. Jennie Ponsford is Professor in the School of Psychology and Psychiatry at Monash University, and Director of the Monash-Epworth Rehabilitation Research Centre at Epworth Hospital in Melbourne, Australia. Over the past 30 years she developed rehabilitation programmes and conducted research investigating outcomes following head injury and evaluating rehabilitative therapies. She has written two books and over 120 journal articles on the subject. Sue Sloan is an accredited Occupational Therapist and Clinical Neuropsychologist. She has worked in private practice for the past 15 years and provided community rehabilitation services to people with severe acquired brain injury. Sue also provides clinical supervision to students at Latrobe University and Monash University, Australia. Pamela Snow is an Associate Professor in the School of Psychology and Psychiatry at Monash University. She is a psychologist and speech pathologist, and has an extensive clinical and research history in the field of TBI, and a current research focus on language competence in high-risk adolescents.